This graph is much simpler. 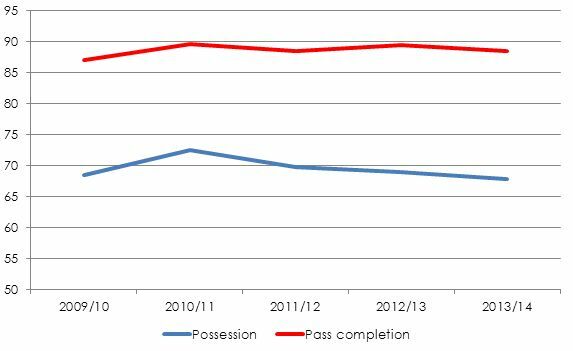 It shows the average possession along the bottom, and the pass completion rate along the left. These two metrics are generally considered to be, more or less, the same thing. 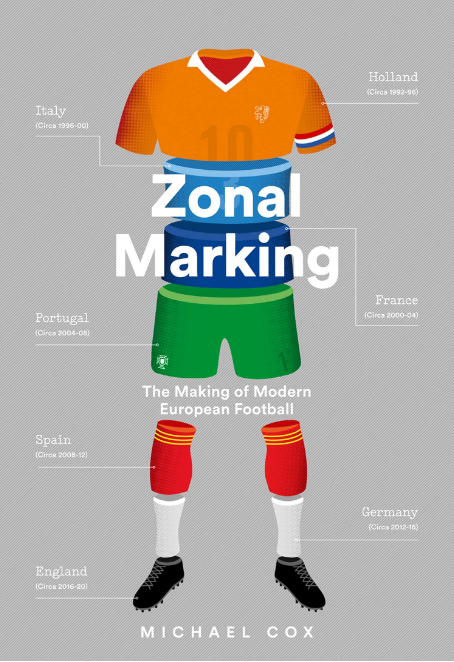 They measure how well each side passes the ball. If your pass completion rate is very high, logically you’ll keep possession more. Or, to look at it the other way around, if your side is focused upon keeping possession, they’ll play safe passes and therefore complete a high percentage of them. Nothing too complex there. This graph, then, which looks at Premier League sides over the course of this season, essentially confirms this pattern. The 20 sides averaged between 37% and 59% of possession, and their pass completion rate is between 71% and 86%. There’s a pretty obvious correlation throughout, from Crystal Palace to Manchester City and Arsenal, favourites for this weekend’s FA Cup final according to William Hill football betting. Labels of each side are included for interest, but in truth there’s only one side that is worth discussing in greater detail. That is Southampton, who bucked this trend by managing to record the highest average possession in the division (58.6%), despite only the ninth-highest pass completion rate (81.4%). That’s shown in greater detail by stripping the graph of labels, and putting in a ‘line of best fit’ to show what an anomaly Southampton are. How have they managed this? Well, put simply, because possession statistics don’t simply show how effectively a side keeps the ball, they also take into account how quickly they win it back. 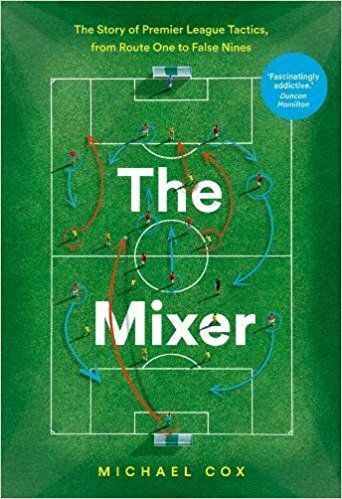 Southampton manager Mauricio Pochettino is, famously, a discipline of Marcelo Bielsa, the Argentine coach who puts a huge emphasis upon pressing, and winning the ball quickly. “Our simple ethos is this: try to win the ball back as quickly as possible, as far up the field as we can – and by that I mean everyone is involved in winning the ball, back from the forwards to anyone else,” Bielsa once said. When Bielsa was in charge of Athletic Bilbao, his side recorded very similar statistics: a very high possession share, despite a relatively mediocre pass completion rate. Pochettino was also a huge influence upon Pep Guardiola, of course, and throughout his reign at Barcelona (and that of the late Tito Vilanova) the club dominated possession in every single match for five seasons, ending with this season’s 4-0 victory at Rayo Vallecano under Tata Martino. The change under Martino isn’t that Barcelona are passing less reliably, it’s that they’re sitting deeper and winning the ball closer to their own goal. In the past five seasons, Barcelona’s pass completion rate has remained relatively static, but the average possession share has dropped by almost 5% between their peak of 2010/11 and this season. 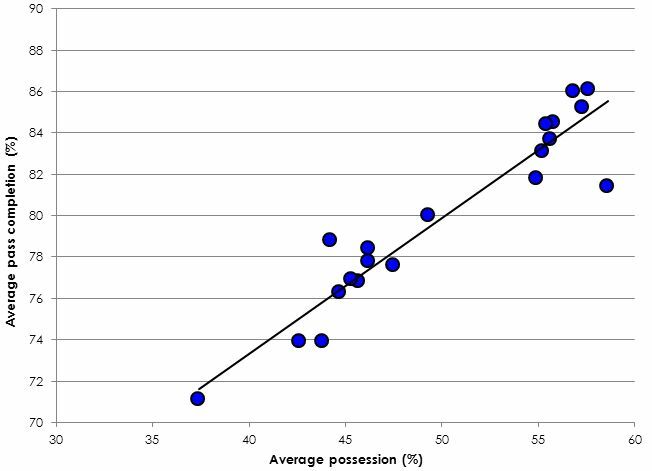 A resurgence of counter-attacking football means possession statistics have become less popular and probably less telling than when Barcelona were at their peak, but it took a couple of seasons before their pressing became as vaunted as their ball retention – that was the key to their unprecdented possession statistics. As Southampton have demonstrated, you can be average at actually keeping the ball, yet still be the best side in the league at dominating possession. You simply have to press high up the pitch. Thanks for the good article, as always. It’s interesting that ManU and Sunderland are not outliers on this graph; they were on your earlier one. Southampton are outliers here but not on that one. Where does the raw data come from? I’m not sure Southampton really is an outlier. No analysis of Europa League final between Benfica vs Sevilla, Michael? +1 Mysterio,Michael, Europa League final analysis is due. Pochettino a discipline of Bielsa? I think it should be “disciple of”. Almost as interesting is Fulham, who apparently pass the ball incredibly well, but just don’t have it for long when they do pass it…. That’s the natural result of an old, slow side, magnified by having some of the laziest forwards in Europe. When they were playing Bent and Berbatov together, it was just painful to watch. It’s not so much that Fulham don’t have it for long, as that Fulham can’t win the ball back; I.e. Other teams have great pass completion %s against them. 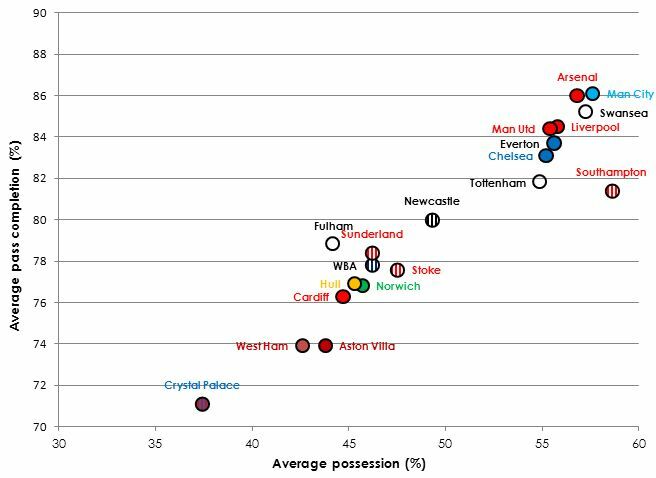 What the graph suggests to me is that despite the backlash against the possession obsession, the stronger a club are, the more of the ball they will have. Even Chelsea don’t buck that trend. The apparent outliers when you take into account league positions are Swansea (much more possession and better passing you’d expect considering their struggles) and West Ham and Crystal Palace, the two teams who most evidently don’t want the ball. I think it’s fair to say that along with Southampton, Swansea (by nature of their whole succession of managers in a similar tradition), West Ham and Palace (both directly due to their current managers’ preferences) are the most ideological teams in the Premier League right now – they play one way whatever the circumstances. The difference between East London and South London clubs is that West Ham fans apparently expect a different kind of football, and Crystal Palace fans don’t, and more than happy with the results Pulis has achieved. You could make a similar chart for the top goalscorers to identify who is a flat track bully and who rises up to the occasion. The problem is that “possession” is kind of a weird stat. Both stats have successful passes as denominator. (Usually possession is the percentage of successful passes a team has in a game) So what this graph is showing is a ratio of opponents successful passes to a teams unsuccessful passes. I’m not sure this means anything or what use it is really.